This is only one of many ways to do a home kill. Just remember this is our way at Men’s Domain. There are a few rules and regulations that you may need to follow so check them out here New Zealand Food Safety Authority. 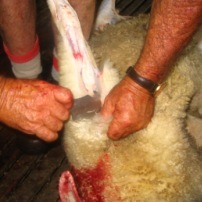 Holding the front leg between your knees pull the wool up and cut the skin away down towards the throat. You will need to do this on both sides of the sheep. This is just a view of what you should end up with once you have cut down both sides. Try and skin as much as you can down the shoulders as well. Next thing to do is to break the joints. This is just the same as we do the rear joints which is shown in part 1. 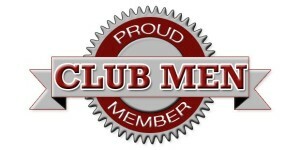 Now you will need a bit of elbow grease for this. 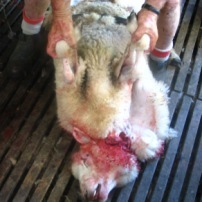 You need to take the skin off the belly region so push your fist from the front of the sheep to the rear under the skin. You will need to do this on both sides. Now for the last bit of part 2 is to take the brisket off and cut it. Pulling the skin off the brisket takes a bit of effort. Once you have the skin off you need to cut it and then saw though the brisket.